Fitting instructions and technical documents are all PDF files you can download, click to open or right click and choose “save as”. To view vehicle information click on the cars names and the information will expand. Vehicle information, click car name to expand. 1997 to 2004 model Porsche 911 and Boxsters have two original audio systems. The earlier cars had a system similar to an Audi, the speakers are amplified and the head unit suppliers the audio to the amplifier via a low level signal from the Mini ISO connector. 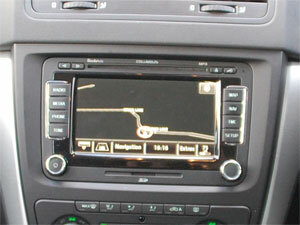 These cars require high to low level adapters to fit new head units or handsfree kits. Later models use a fibre optic network to send the audio signal from the head unit to the amplifier. For these cars, the original amplifier needs to be bypassed. There are no plug and play amplifier activation or bypass products available. Generally the CD22/CDR22 original units have the Audi style system, CDR23 units can be either low level like the Audis or fibre optic. 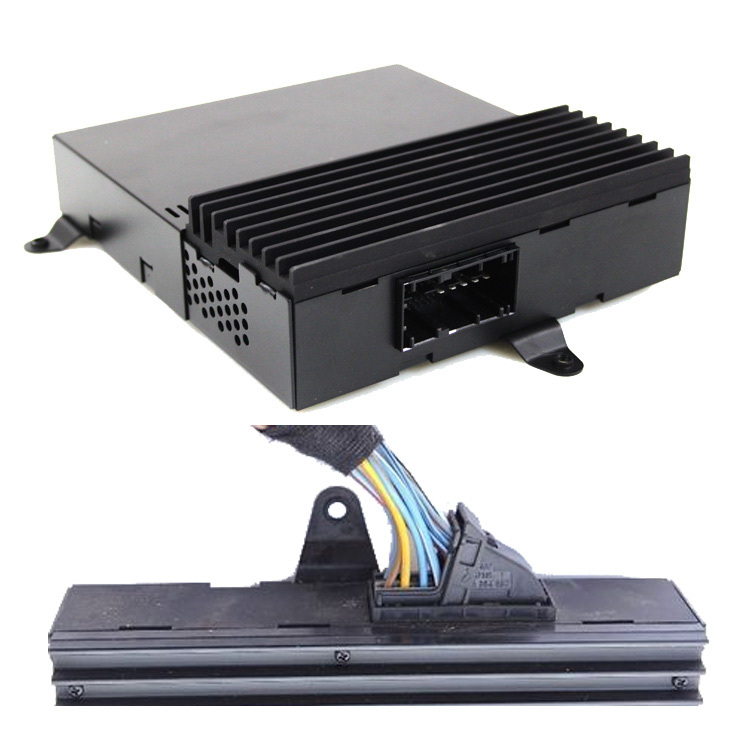 It is best to either find the amplifier under the front bonnet and look for fibre optic cables, or remove the head unit and look at the connection on the back. Here is a picture of a car using a low level signal in the Mini ISO yellow connector to connect to the amplifier, note that all six positions are populated. These wires are the positive audio signals for front left, front right, rear left and rear right speakers, a common speaker negative and the amplifier turn on signal. Here is a picture of a head unit using the fibre optic connection. Note that there are only four wires in the yellow Mini ISO, unlike six in the older version. These four wires are data wires, they do not carry any audio signal. There are some cars with the very basic audio option, these have a traditional speaker ISO connector with the head unit driving the speakers directly. No audio adapters are needed for these cars. The Porsche 911 cars have a variety of amplified audio options, depending on what is in the car affects what fitting parts are required when installing a new stereo. The information below describes the different original audio equipment that is in these cars, this information is needed to make sure the correct parts are used when fitting a new stereo. Unlike the Boxster and Cayman, the 911 cars were all fitted with the high end PCM2 and 2.1 head units. These units have ISO connectors at the rear. There are two types of audio systems in 911s, ASK amplifier, known as the Sound Package Plus system (SPP) and Bose premium amplifier. The ASK amplifier has audio supplied to it from the head unit from the normal speaker ISO connector, a +12v feed turns on the amplifier. The Bose amplifier has a fibre optic connection from the head unit. 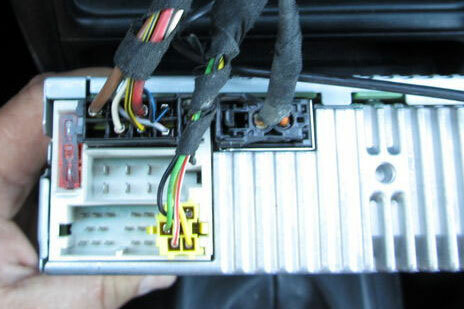 The image below shows the connection at the radio for cars with the ASK and Bose amplifiers. The left image is a car with an ASK amplifier, all 4 channels are populated in the speaker ISO and there is an amplifier turn on wire (thin black with red stripe) in the power ISO connector. The image to the right has a Bose amplifier, there are no speaker wires present, the audio is sent to the amplifier via the orange fibre optic cables. Note: the car with the ASK amplifier also has fibre optic cables, these connect the head unit to the CD changer, they do not carry audio to the ASK amplifier. The type of amplifier can be identified by looking at the wiring behind the radio, as per above images, or by looking at the door speakers. Cars with Bose amplifiers will have Bose branding on the speaker grills. See the image below. Like the earlier version 911, the 2009 to 2012 models are only fitted with the high end PCM 3 head units, the CDR30 unit is not an option like the Boxster and Cayman. The PCM3 units have a quadlock connector at the rear instead of ISO connectors like the earlier model. They have the same options of ASK and Bose amplified audio systems. The type of amp can be identified in the same way as the earlier model, either by the Bose branding on the speakers grills or by looking at the connectors at the back of the radio. 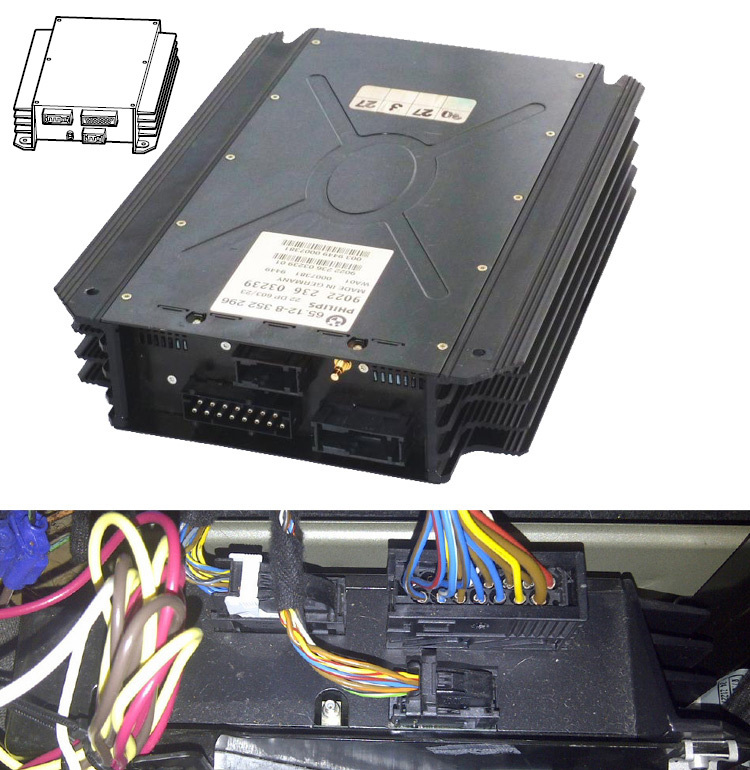 Below shows a car with ASK amplifier (image 1) and a car with Bose amplifier (image 2). Note how the car with an ASK amplifier has speaker wires present in the quadlock connector and the car with Bose does not. There are two types of audio systems in 911s, ASK amplifier known as the Sound Package Plus (SPP) and Bose amplifier. The ASK amplifier has audio supplied to it from the head unit from the normal speaker ISO connector, a +12v feed turns on the amplifier. The Bose amplifier has a fibre optic connection from the head unit. E81 3 door hatchback, E82 2 door coupe, E87 5 door hatchback, E88 2 door convertible. The BMW 1 series had a facelift to the dashboard in 2007, this facelift allowed for the possibility of fitting double DIN aftermarket head units. Below shows the difference between the pre and post facelift dashboards. The E46 is the forth generation of the popular 3 series BMW car. There are several options of original audio systems in these cars. Basic Audio. The basic audio systems have a standard tape or CD player head unit in the dashboard. Some older models also have a basic small text screen based navigation display. These basic setups will have a 17 way round pin connector at the back of the head unit. Some cars with the basic head units will also have a Harman/Kardon amplifier. Basic with Harman/Kardon. The Harman/Kardon amplifiers are turned on by a 12v switch signal. The head unit sends the audio to the amplifier via a low level (pre amplified) signal. Fitting new head units or handsfree kits will require high to low level audio adapters. Navigation screen head unit. Cars with original navigation screens have the radio tuner module in the rear of the car, it is behind the left hand panel in the boot. There are two types of tuners, one has the 17 way round pin connector and the other has the 40 way quadlock connector. 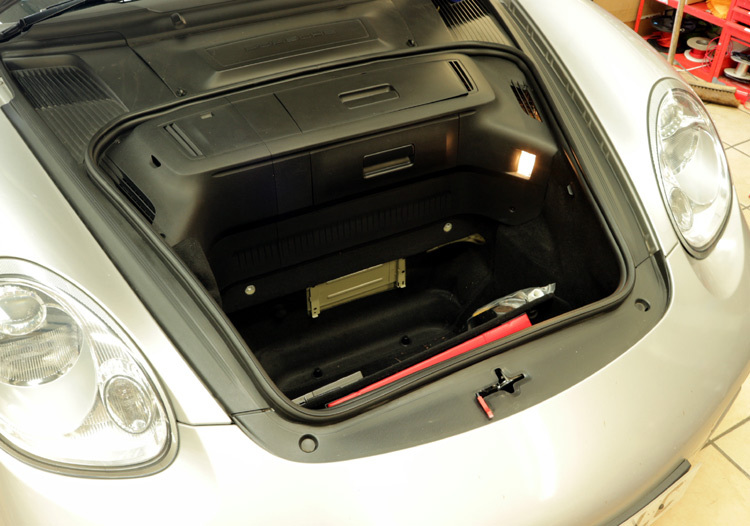 It is a 10-15 minute job to remove the panel in the boot and locate and identify which type of tuner is in the car. Pictures of the units are below. Navigation and round pin tuner. The cars with round pin tuners work on the same basis as the cars with the basic head unit and basic head unit with Harman/Kardon. The main difference is that the tuner unit and round pin connection is in the boot so extensions from rear to front are required. Image of the round pin tuner module. BM23. Navigation and quadlock tuners. Like cars with the round pin tuners, cars with the quadlock tuners will require extensions from rear to front with the appropriate connectors. Cars that have the quadlock tuners and Harman/Kardon amplifiers are more complicated. The amplifiers are digital (DSP) and therefore need to be bypassed in order to install a new after market head unit. The same wiring and extension leads are required but no audio will be supplied to the speakers using these parts. Image of the quadlock tuner module. BM54. The Nissan 350Z have a facelift in 2006 which affects the radio fascia. It is a very minor difference in the fascias needed from the pre facelift to post facelift models. The easiest way to tell if the car is the older or newer model is to look at the styling around the gear stick and the location of the hazard switch. In the picture above you can see the different styling around the gear stick and the position change of the hazard switch. The left image is of the 2003 - 2006 model, the hazard switch is positioned further back near the handbrake, the 2006 - 2010 model on the right has the hazard switch further forward on the dashboard located between the gear stick and below the climate controls. Most 350Z cars have factory fitted Bose audio systems. New equipment like head units and handsfree kits can be easily added to this system using high to low level adapters. The original head unit supplies the audio to the amplifier via a low level signal. When fitting a new head unit, sometimes the audio sounds quieter than expected, this is normally caused by the new head unit having 2V preouts. Head units with 4V preouts will provide better audio. Another way to get better audio is to use an adapter lead for a non amplified car, use the ISO speaker outputs from the head unit and run the audio through a high to low level interface, this will give the best audio quality. The Bose amplifier is turned on by a 12V switch signal. This diagram shows the position of the amplifier turn on (AMP ON) pin. Use the 12V switch output from the new head unit (blue/white wire) to turn the amp on. The original A3 (or Typ 8L) was introduced in the European market in 1996, marking Audi's return to the production of smaller cars following the demise of the Audi 50 in 1978. This was the first Volkswagen Groupmodel to use the "PQ34" or "A4" platform, bearing a close resemblance to the contemporary Volkswagen Golf Mk4, which arrived a year later. Within three years, this platform was used for total of seven cars. The A3 was initially available only with a three-door hatchback body, to present a more sporty image than the Golf, in both front and four-wheel drive. The inline four-cylinder engines were transversely mounted. After the A4, the Audi A3 was the second model in the Audi lineup to use five valves per cylinder. The United Kingdom market first received the Audi A3 in November 1996. In 1999, Audi expanded the range with the introduction of more powerful versions: a 1.8 turbo rated 180 PS (132 kW; 178 hp), and a 1.9 TDI diesel engine with unit injector "Pumpe Düse" (PD) technology and variable geometry turbocharger. The four-wheel-drive A3 1.8T quattro used either the 150 PS (110 kW; 148 hp) or 180 PS (130 kW; 180 hp) engine, and the same Haldex Traction-based four-wheel-drive system as the Audi S3 and the Audi TT. Also in 1999, Audi also introduced a five-door body. In late 2000, the A3 range was revised with new headlights and rear lamps, other minor cosmetic changes, an improved interior, and the introduction of a six-speed manual gearbox, on the 180 PS (132 kW; 178 hp) 1.8 Turbo and the new 130 PS (96 kW; 128 hp) 1.9 TDI. Audi's electronic stability control, traction-control, and brake force distribution computer became standard equipment in some countries. Although the first-generation Audi A3 was replaced in Europe in 2003, the first generation model continued to be sold in some markets. Production of the first generation model stopped in Brazil in 2006. The Audi A7 was first released in 2010. There was an update to the car in 2012 and a further facelift in 2015 which included a new multimedia system. 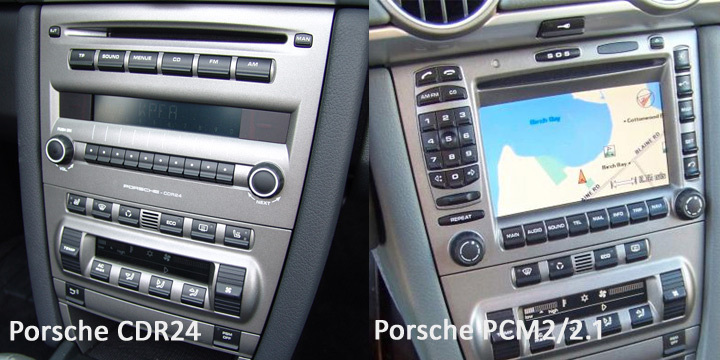 The Porsche Boxster and Cayman 987 cars have a variety of original radio and amplifier options, depending on what is in the car affects what fitting parts are required when installing a new stereo. 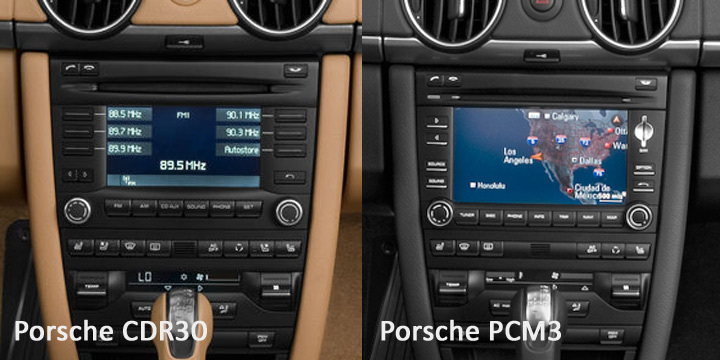 The Porsche Boxster (convertible) and Cayman (coupé) have several different setups for the original audio systems. Earlier models from 2005 to 2008 had the CDR24, PCM2 or PCM2.1 systems. The CDR24 was the basic head unit, the difference between the PCM units is the PCM2 has a CD player and the PCM2.1 has a DVD player. All these head units have ISO connectors at the rear. Below are examples of the CDR24 and PCM2/2.1 original units. There are also several amplifier options with these cars, non-amplified, ASK amplifiers known as the Sounds Package Plus (SPP) or premium BOSE amplifier. 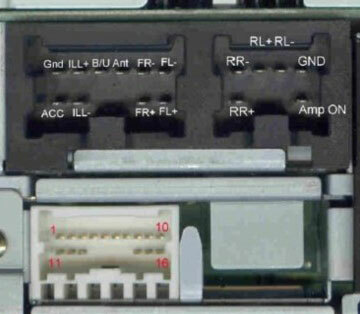 Cars that are non-amplified will have two pairs of speaker wires in the ISO connector at the rear of the head unit, see image 2 below. ASK amplified cars have either 4 pairs of speaker wires in the ISO connector, see image 1 below, the amplifier requires a 12V switched turn on signal. The 12v turn on wire is the thin black/red wire in the black power ISO connector. Cars with Bose will have no speaker wires present at the head unit, see image 3 below. The audio signal from the head unit is sent to the amplifier via fibre optics, a special interface is required for these cars or the amplifier will need to be bypassed or replaced. The amplifier is located under the front bonnet, see the image below, the image is of a non amplified car, you can see the blank metal plate where the amplifier is mounted. A small panel needs to be removed to access the amplifier location. Below is an image of the ASK amplifier. Below is an image of the Bose amplifier. 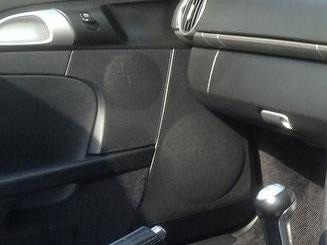 The type of audio system can also be identified by looking at the speakers in the door panel. Non amplified cars have a single large speaker in the door and a tweeter on the dashboard, see image below. 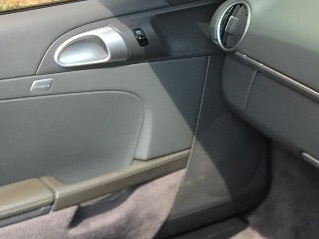 Note that the panel between the large speaker and the door handle is blank, cars with amplified systems have a mid range speaker here. 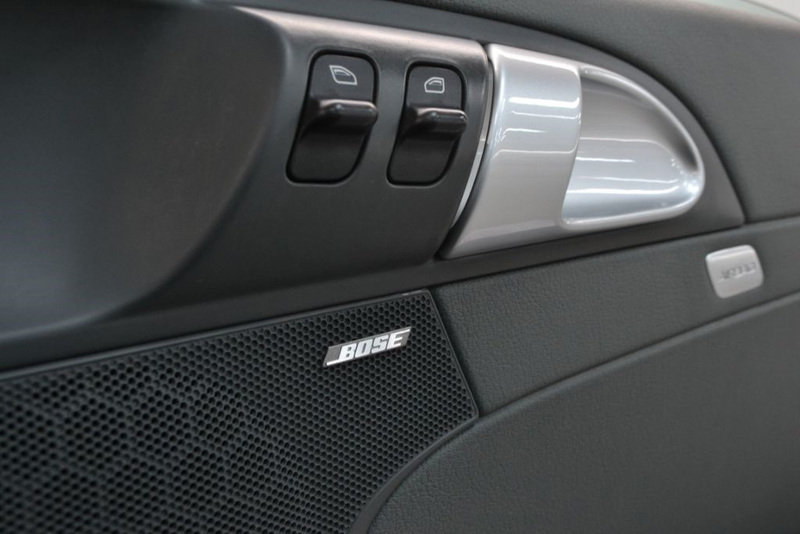 Cars with the Bose audio systems have woofer and mid range speaker grills in the door panel and a Bose badge in the top corner of the grill panel that covers the mid range speaker. See the images below. Cars with the ASK (Sound Package Plus) amplifier have the same speaker grill configuration as cars with Bose but without the Bose branding. However, there are some model cars that have the additional mid range speaker grill present in the car but do not have an amplifier or mid range speakers. 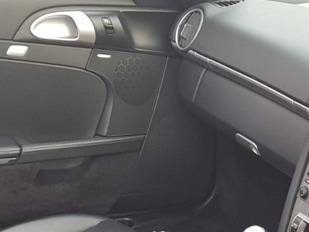 The image below shows a door panel with the woofer and mid range speaker grills with no Bose branding. From 2009 to 2012 the car was facelifted. The noticeable change is the colour of the dashboard, it has changed from silver to black and the original head unit options have been upgraded. Facelift models have either a CDR30 or PCM3 audio system. Below are examples of the CDR30 and PCM3 original head units. The CDR30 and PCM3 units also have quadlock connectors at the rear, replacing the ISO connectors on the older models. Similar to the older models with ISO, there are different amplifier options for these cars, some using speaker level outputs from the head unit and some using a fibre optic connection from the head unit to the amplifier. 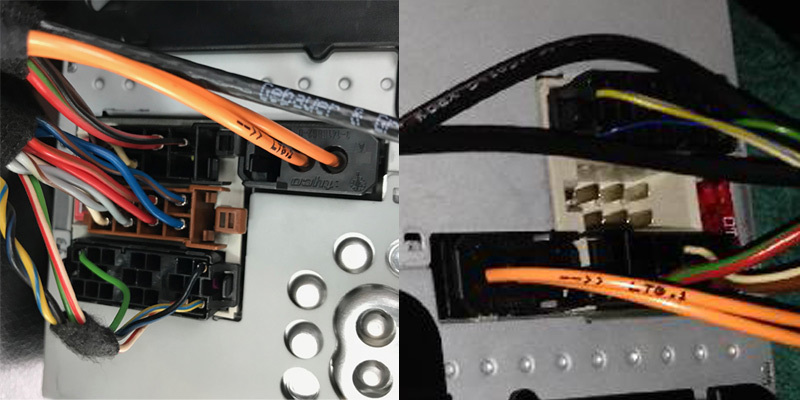 Below are examples of the quadlock wiring. 1 is a car with 4 speaker channels in the quadlock and no fibre optic cables. 2 is a car with fibre optic connections for the audio and no speaker wires in the quadlock. There are also several amplifier options with these cars, non-amplified, ASK amplifiers known as the Sound Package Plus system (SPP) or premium BOSE amplifier. Cars with the ASK amplifier (Sound Package Plus SPP) have the same speaker grill configuration as cars with Bose but without the Bose branding. However, there are some model cars that have the additional mid range speaker grill present in the car but do not have an amplifier or mid range speakers. The image below shows a door panel with the woofer and mid range speaker grills with no Bose branding. There are also several amplifier options with these cars, non-amplified, ASK amplifiers known as the Sound Package Plus system (SPP) or BOSE amplifier. The second generation Skoda Fabia was produced from 2007 to 2014. 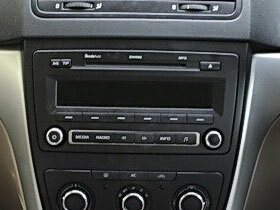 Nearly all cars have the Volkswagen double din radio (sometimes branded as Skoda Swing, Dance, Bolero), however, there are a very small amount of cars that have a smaller Skoda Beat head unit, these cars with the Beat head unit require a different fascia panel, only a single din radio can be installed, a double din will not fit. Both the Volkswagen style units and the Beat unit use a quadlock connector at the back of the radio. Amplifier turn on information for cars with original 3-section 6 disc radios and Harman/Kardon amplifiers. Below is a diagram of the original connector in the Freelander. The highlighted position is the position of the amplifier turn on wire. When changing the radio in cars with the original 3 section 6 disc radios, if the car also has the Harman Kardon amplifier, the amplifier will require a +12V switch feed to turn it on. Use the amp/antenna turn on output from the new radio to power this wire in the car. No additional audio adapters are required as the harman kardon amplifier takes a standard speaker level audio input. The Freelander 2 was produced from 2006 to late 2014. In 2013 the dashboard had a facelift. The below image shows the 2006 - 2013 model dashboard in comparison to the 2013 and 2014 facelifted dashboard. The dashboard on the left is the 2006 - 2013 model. The dashboard to the right is the 2013 and 2014 facelift model. Fitting parts are available for the earlier 06-13 model, the 13-14 model fitting parts are under development. The ford Fusion was launched in 2002 and ran until 2012. Like the Fiesta, around 2005/6 there was a facelift. Earlier models have the three section radio in the dashboard, the dashboard requires cutting in order to install an aftermarket, later models had the large 6000CD headunit. The Seat Ibiza mk4 was released in 2008, in 2014 the car had a facelift. The facelift included an update head unit which had the hazard button and the passenger airbag light moved from the button cluster by the gear stick to the radio face. Because of this special parts are required for the 2014 onward model when changing the head unit. 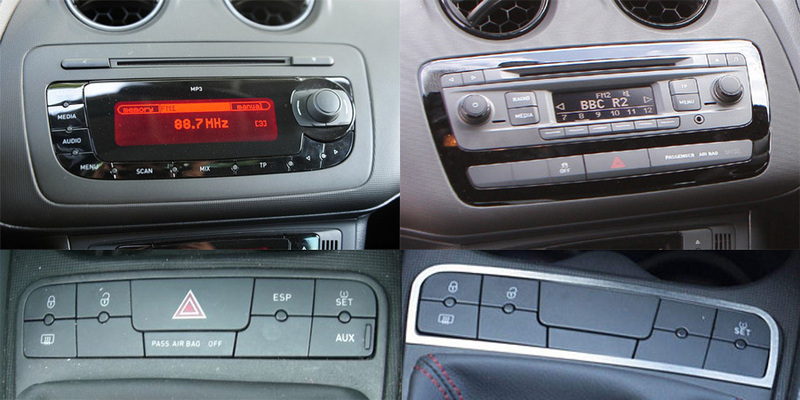 Below are pictures of the earlier model dashboard and the facelifted dashboard with the buttons in the new positions. The older model to the left has the hazard, ESP and airbag buttons on the button cluster down by the gear stick. The facelifted model to the right has the hazard, ESP and airbag buttons built into the radio. In order to fit a new head unit into the facelift model, a button panel from an earlier model with the corresponding buttons is required. Our fascia fitting kit includes the harness adapter to extend the connection to the new button panel. Depending on the specification of the car, there are various different button panel combinations available. A new button panel is required to combine the existing button panel by the gear stick with the buttons on the radio panel. See the table below for the available replacement buttons. Here is a link to the button panels on our website, please note these are special order items and confirmation of the exact panel is required. NOTE: The AUX button is not relevant as this only works with the original radio. The third generation of the Renault Megane had a facelift in 2012. The earlier models have quadlock connectors at the back of the radio, facelift 2012 models have the newer Renault/Dacia style white radio connectors. 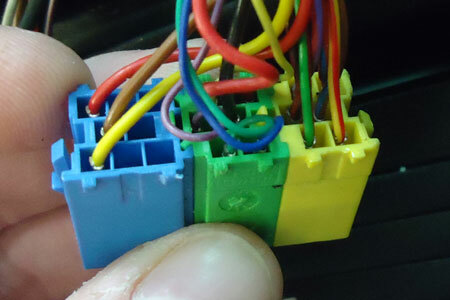 For cars around the facelift change it is best to remove the head unit to check what type of connector has been used. It is not possible to fit a double din head unit into a Megane III. The third generation Mazda MX-5 was produced from 2005 to 2015. There was a facelift at the beginning of 2009. 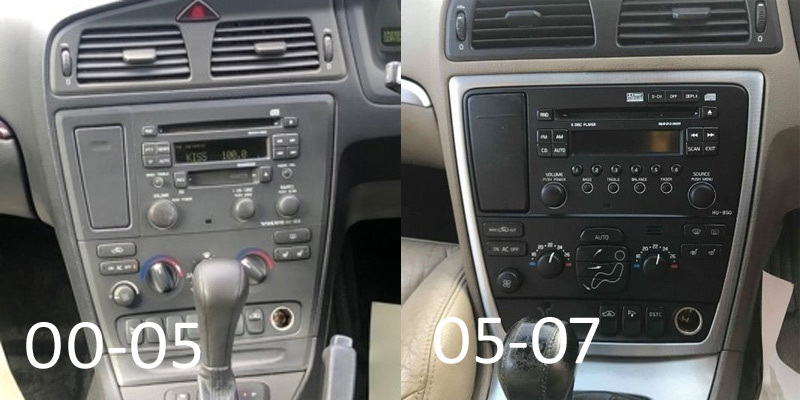 It is very difficult to identify the pre and post facelift models from looking at the radio alone as they are almost identical, there are subtle changes to the moulding which do mean different fascia panels are needed when changing the head unit. The easiest way to identify the facelift change is by the styling change of the fog lights as shown in the image below. 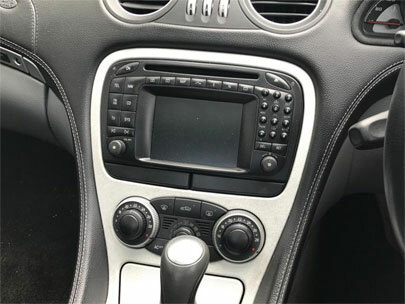 When fitting a double DIN radio into a D40 Navara, if the car has an original basic radio, no fitting fascia is required as the original radio is a double DIN size. Use the original mounting brackets from the radio to mount the new aftermarket stereo. If the car has original navigation, it is possible to fit an aftermarket double DIN radio in place of the original screen. NOTE: the dashboard may need to be trimmed in order to allow the new stereo to fit. The forth generation Volkswagen Polo had a facelift mid production around 2004. The earlier models had original tape cassette headunits with optional CD changers, these cars had ISO connectors at the back of the radio. The later facelift models have a double DIN sized original CD player head unit, these later models have a Quadlock connector at the rear of the radio. 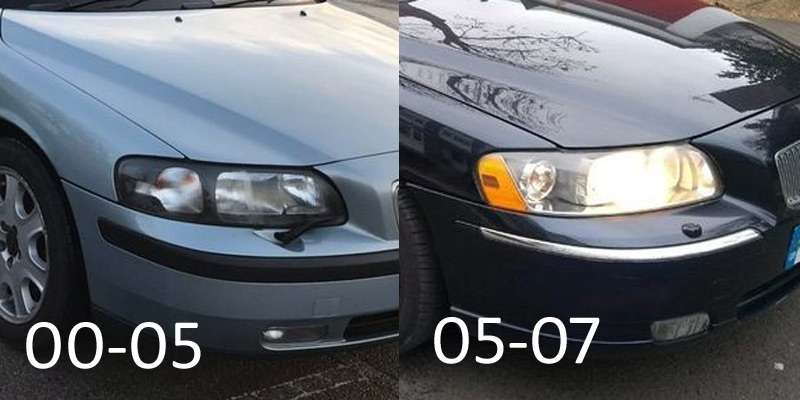 It is very easy to differentiate between the pre and post facelift models by looking at the headlight styling, see the below picture. The earlier model Range Rover L322 cars had two types of head units in the dashboard. The basic Multi Information Display (MID) head unit, and the high line Multi Function Display (MFD) head unit. The basic MID unit was available as a cassette tape player, a CD player or a Mini Disc player. The high line MFD head unit had a cassette player behind the motorised screen and a CD changer in the glove box, the tuner radio module is located in the rear of the vehicle in the rear left quarter panel. There are also three options for the audio system. Non amplified audio system, Power amplifier and DSP (Digital Signal Processor) amplifier. The non amplified audio system has two way speakers in the front doors and single speakers in the rear doors. Audio is supplied directly from the head unit in cars with the basic MID head unit system, or from the tuner radio module in the rear left quarter panel on cars that have the high line MFD head unit system. 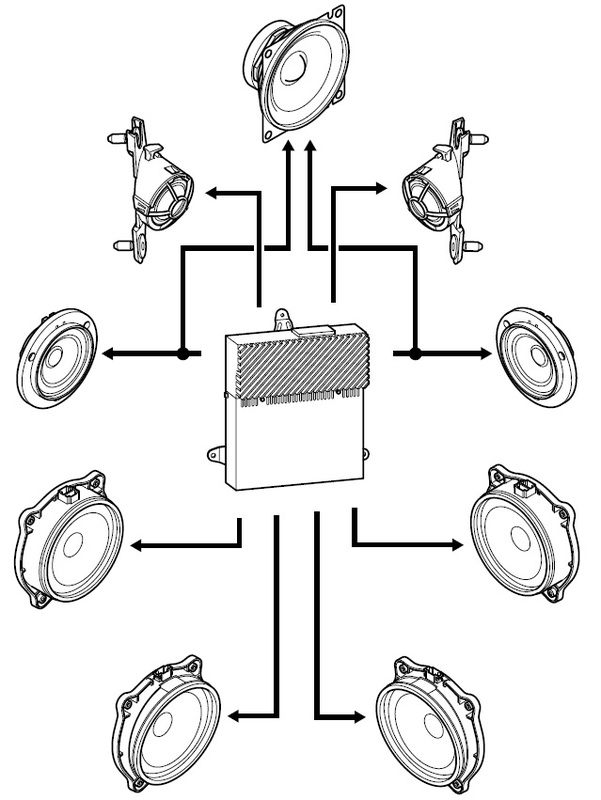 Below is a diagram of the non amplified basic audio setup. Some cars have a power amplifier, these amplifiers are switched on by a +12V turn on signal, this is the same signal as the antenna turn on. The amplifier receives a normal audio signal from the basic head unit or tuner radio module and then drives the speakers in the car. Cars with the power amplifier will have single speakers in the rear doors, three way component speakers (low, mid and tweeters) in the front doors and a centre speaker on the dashboard. The centre speaker is bridged between the front door mid range speakers. 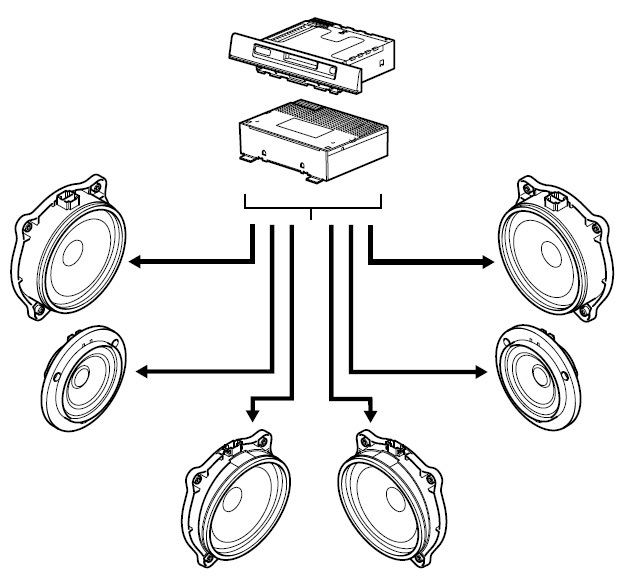 Below is a diagram of the power amplifier audio setup. Below is an image of the power amplifier. Note the styling of the heatsink fins and the single large connector with locking latch, this is how the power amplifier can be differentiated from the DSP amplifier. DSP (Digital Signal Processor) amplifier. Some cars have a DSP amplifier, these amplifiers are switched on by an I-Bus data signal and receives a data audio signal from the basic head unit or the tuner radio module. Cars with the DSP amplifier will have single speakers in the rear doors, three way component speakers (low, mid and tweeters) in the front doors, a centre speaker on the dashboard and a dual subwoofer in the boot (in the rear left quarter panel, forward from the amplifier and tuner radio modules). The centre speaker is bridged between the front door mid range speakers. Below is a diagram of the DSP amplifier audio setup. Below is an image of the DSP amplifier. Note the styling of the heatsink on the sides of the amplifier and the three connectors, one large round pin connector and two smaller connectors with locking latches, this is how the DSP amplifier can be differentiated from the power amplifier. Because of the head unit and audio options, there are 6 setup possibilities for the 2002 - 2005 model cars. 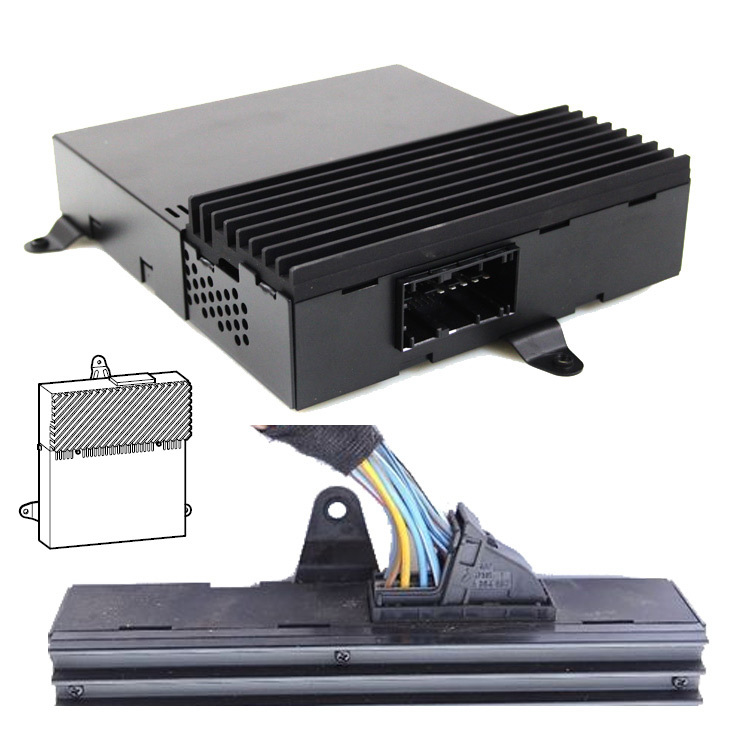 There are three common setups that are usually seen in the cars, they are the basic head unit with basic audio, basic head unit with power amplifier and the high line head unit with DSP amplifier options. The other options are fairly rare to see. The Mercedes SL had a facelift after 2004. The dashboard changed and this affects the way a new radio is fitted. The older pre facelift models had a single large dashboard panel that surrounded the radio and the climate controls. The later models had a split panel that surrounded the climate controls but the radio was wider and filled the top half. The above picture shows the pre facelift dashboard, see how the original silver dashboard panel surrounds both the climate controls and the radio. The below picture is of a post facelift car, the dashboard panel ends above the climate control, the radio is larger. This creates a divide between the lower dashboard panel and the radio. When fitting a radio into the pre facelift model, the dashboard panel will need to be cut in half to mimic the original panel for the post facelift car. This will allow our fascia panel to fit. Mercedes SL cars have fibre optic audio systems. 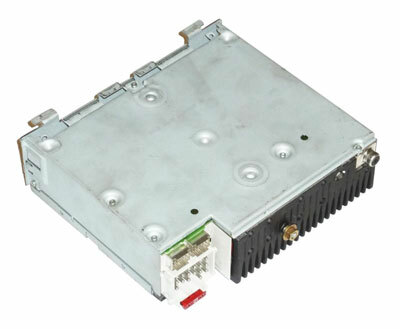 The head unit communicates to the amplifier and tuner module on a fibre optic network. Because of this there are no plug and play adapters, the CANbus steering control interfaces need to be hard wired and the audio amplifier needs to be bypassed. Below is information describing the differences between the 2004-08 and 2009-11 models Mercedes SLK R171 and the different audio equipment options in the cars. This information is important to correctly identify the model and spec of the car so that the correct parts can be used for fitting an aftermarket stereo upgrade. The SLK R171 was launched in 2004, at the end of 2008 the car was facelifted, there are subtle changes to the exterior styling which can make identifying the pre and post facelift cars easy. There were also changes to the audio equipment and the steering wheel control buttons. The audio changes are important as the wiring and setup of the audio system components determine the parts that are needed when fitting a new radio. The image below shows the facelift changes. 2004 - 2008 pre facelift cars had two main original radio options, the basic Mercedes NTG1 radio and the upgraded Mercedes COMAND APS NTG1 navigation radio. The basic NTG1 radio is a traditional style radio, all components are within the double din unit in the dashboard and there is a quadlock connector at the back of the radio. The COMAND (Cockpit Management and Data System) APS NTG1 is broken down into three separate components. The head unit in the dashboard with the screen, an Audio Gateway (AGW) module that contains the radio tuner, basic audio amplifier and MOST controller, and the navigation processor. These components are linked using a MOST (Media Orientated System Transport) fibre optic network. 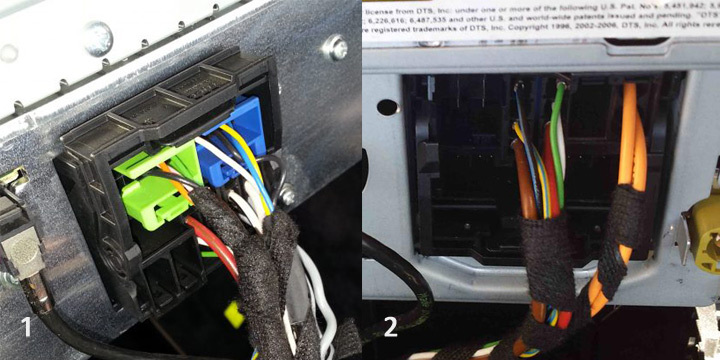 Because of this type of set up changing a radio is more complicated, a fibre optic interface is needed to integrate audio from a new radio with the fibre optic, also there is no quadlock connector in the dashboard behind the head unit so the new radio needs to be hard wired into the car. Both the basic NTG1 and the COMAND APS NTG1 radio options have the added option of an upgraded harman/kardon amplified audio system. 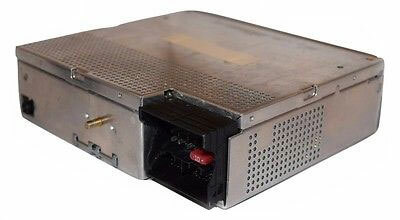 The amplifier is connected to the original radio system via the MOST fibre optic network so a special fibre optic interface is required to integrate a new radio with the original amplifier. The harman/kardon amplified systems can be identified by harman/kardon branding on the speaker grills. Below are images of the basic NTG1 radio, the COMAND APS NTG1 radio and the harman/kardon branding on the speaker grills. 2009 - 2011 facelift cars have similar equipment options to the pre facelift model with basic and navigation radio options and the option for a harman/kardon amplifier. The NTG1 radios have been updated to the NTG2 version, the basic radio now with a colour screen instead of the LCD screen. There is also different wiring in the quadlock connector that is used at the back of the radio. The COMAND APS NTG2 radio has been updated to be a more cost efficient, integrated unit with simplified wiring compared to the COMAND APS NTG1 system. Rather than having three separate units, all the components are in the double din size head unit in the dashboard. The COMAND APS NTG2 uses the same quadlock connector and wiring as the basic NTG2 version making changing the radio easy compared to the older version. And like the pre facelift cars, the facelift cars also have the option of a harman/kardon amplified audio system. The harman/kardon amplifier has a MOST fibre optic connection to the head unit, a special fibre optic interface is need when fitting a new aftermarket stereo. Below are images of the NTG2 and COMAND APS NTG2 radios. The branding of the harman/kardon amplifier on the speaker grills is the same as the pre facelift model. The mk2 Skoda Superb has three original radio options, the basic Skoda Swing radio, the mid range Skoda Bolero radio and the high end Skoda Columbus navigation radio. The original radio will determine what parts are required for fitting a new aftermarket stereo. The Columbus navigation radio is shaped like a standard Volkswagen radio and is based on the Volkswagen RNS510 navigation radio, because of this a Volkswagen radio fitting kit is needed to fit a new stereo. The Swing and Bolero radios are bigger than the Columbus and take up more of the dashboard space, because of this an additional adapter panel is required to convert the dashboard to match a car that has the Columbus radio, this then allows the fitting of a new stereo. The differences from the first to second generation Audi TT are easy to see. Updated vehicle styling and a larger than double din radio replaces the single din sized radio from the older model. Many second generation TTs have the high end Bose amplified audio system, although many TTs don't have the Bose branded system, all second generation TTs have fully amplified audio systems, unlike other Audi cars like the A3 and A4 which have rear amplified systems as standard. The amplifier in the TT is turned on with a 12V switch signal, cars with original navigation systems use a CANbus turn on signal for the amplifier instead. Using our CANbus steering control interface this will turn on the amplifier. It is also possible to change the amp turn on back to a 12V signal using VAG-COM VCDS. Audi TT radio wiring diagram. The DSP EIN position is the amplifier turn on signal. Although the front speakers are marked on the diagram, the wires are not present in the vehicle. Volvo V70, 2000 - 2007 second generation. The Volvo V70 second generation was released in 2000. In 2005 the V70 received a facelift which included styling changes to the dashboard. Also, the headlight styling was changed, this makes identifying the face lift models easy. The correct model year and radio model is important to know to make sure the correct parts are chosen for an installation. Below is an image of the 2000 - 2005 pre facelift and 2005 - 2007 post facelift dashboards. Note that the 05-07 car has an extra piece of trim surrounding the radio and climate controls. This trim is often silver or wood effect. Below is an image showing the styling differences between the headlights. The main noticeable difference is that older models had clear plastics over the lights, whereas the facelift cars have orange plastics over the indicator lights. The V70 cars had a variety of different original radios fitted. The model numbers of the radios are printed on the front of the radio in the bottom right corner. Model number begin with HU- then have a three digit number to identify the radio model. 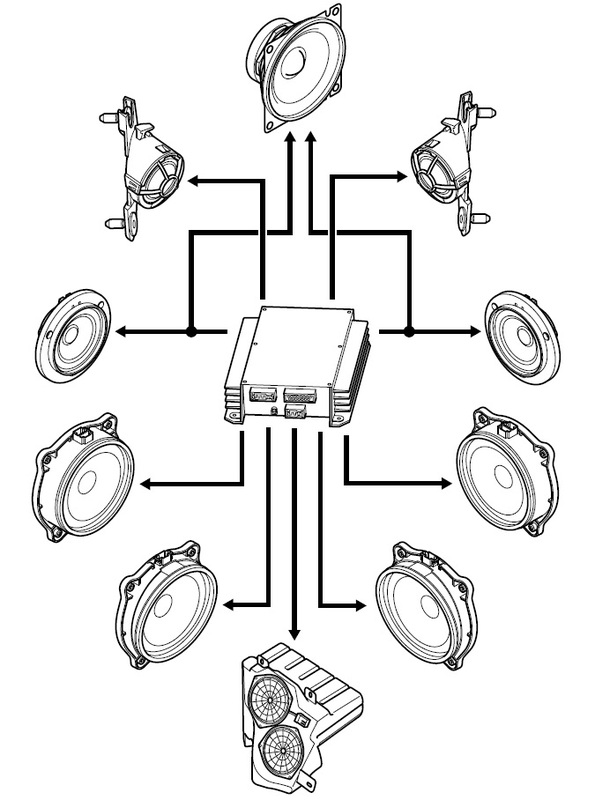 Numbers begin with either a 6 or an 8 and require different speaker wiring depending on which it is. HU-8XX radios supply audio to an amplifier in the car and the amplifier provides sound to all the speakers. A green power connector is present at the back of the radio and the audio is connected via a 6 pin DIN connector to the amplifier. HU-6XX radios supply audio to an amplifier and also audio directly to some of the speakers in the car. A green power connector is at the back of the radio along with a grey connector for speaker connections and a 6 pin DIN connector for audio to the amplifier. The below image shows the different connectors on the HU-8 and HU-6 radios. The 8 pin DIN connectors are used for the CD changer. Jeep Wrangler cars made from 2013 onward often have an upgraded audio system. Most cars have an additional amplifier in the rear of the car powered by an Alpine amplifier, some cars have a fully upgraded Alpine system with Alpine speakers, subwoofer and amplifier. Very few cars have a basic non amplified audio system with no additional subwoofer. The very basic audio system is the same as older model Wrangler cars and other Jeep and Chrysler cars, the amplifier is turned on by a CANbus signal. Any models with an upgraded audio system use a different data turn on signal for the amplifier. When choosing radio fitting parts from our website, be careful to select the correct original equipment option. The E53 is the first generation of the X5 model line. 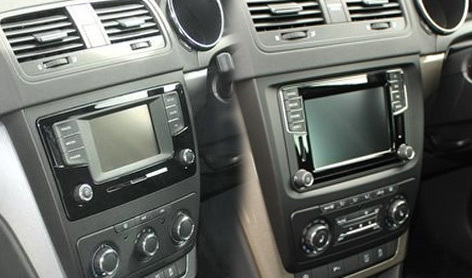 There are two types of radios originally fitted to the BMW X5 E53, standard and navigation. The audio system in the car is wired differently depending on which type of radio is originally fitted. Cars with a standard basic radio have a more traditional setup. 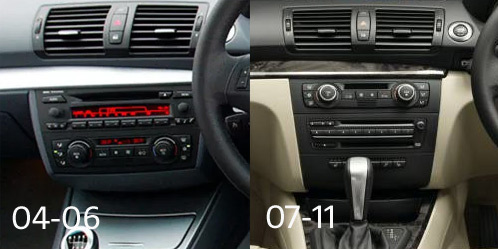 There is a quadlock connector at the back of the radio in the dashboard (some very early models have a round pin BMW connector, these models are rare) and the radio supplies audio directly to the speakers. Installations on these cars are straight forward, using adapters at the back of the radio to fit either a new stereo or a handsfree kit. Cars with the navigation radios have just a screen in the dashboard, other components of the audio system are located elsewhere in the car. The tuner module is under the boot floor next to the battery, the navigation module and cd changer is in the rear left quarter panel, often there is also an audio amplifier in the rear left quarter panel too. Installations in these cars are more complicated, extensions need to be run from the rear to the front. The navigation radios also have different fittings into the dashboard, brackets need to be fixed into the dashboard in order to fit a new stereo. We have a special kit for this supplied with fitting instructions. There are two types of amplifiers fitted to BMW X5 cars, one known as a Power Amplifier is a traditional amplifier. It is switches on by a +12V signal (this is the same signal as the antenna turn on) and it receives a standard audio signal from the radio. New radios can be easily integrated into these systems without the need for special adapters or interfaces. The other type of amplifier is the DSP (Digital Signal Processing) Amplifier. 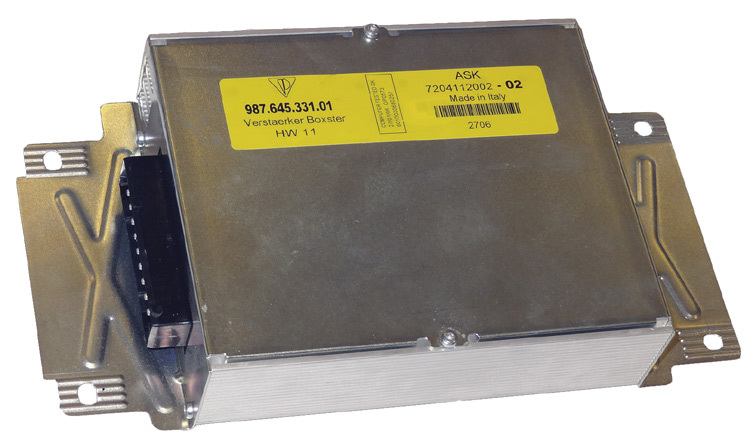 These amplifiers are turned on by a data signal on the cars I-Bus data network, when the original radio is removed the amplifier can no longer be switched on. These amplifiers need to be bypassed in order to fit a new stereo. Below is an image of the Power Amplifier. 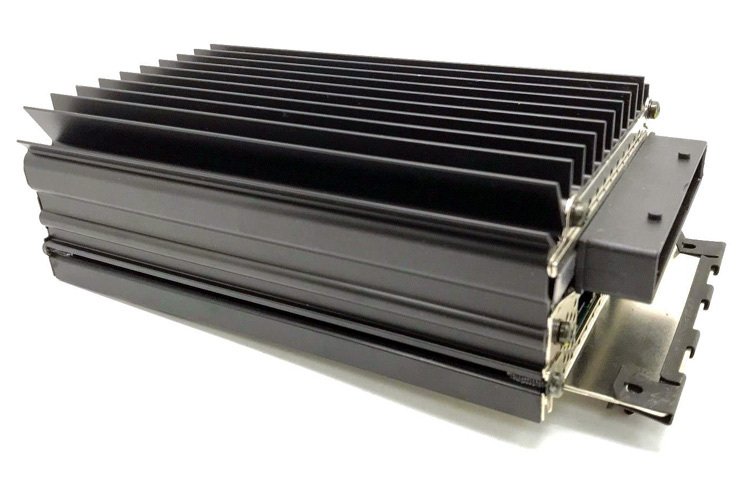 The two amplifiers can be differentiated by the style of the heatsink fins and connectors used. The Power amp uses one large connector with a locking latch, the DSP amp uses three connectors, one large round pin connector and two smaller connectors with locking latches. Skoda Yeti cars have two different shapes of original radios. The two different shapes can be a variety of different specification units from basic, to media and navigation units. See the pictures below to help identify the radio shapes. The above radio is wider and is the same as the Octavia radio. The below radio is narrower and is the typical Volkswagen style radio. Check the size and shape of the original radio to make sure you are using the correct fascia adapter panel. Earlier 2009-2014 models have the traditional 40 way quadlock connector at the rear of the radio. 2014 onward facelift cars have the newer style VW/Skoda radios with the new 52 way quadlock connectors. These new connectors have an extra insert section and large power and ground terminals. The newer models can be identified by the styling of the buttons either side of the radio, they are aligned to the top edge of the radio screen and have a tapered design on the bottom buttons. See the pictures below showing the newer style radios and the button styles highlighted. These radios still use the same style/shaped fascias as the above pictured older radios.